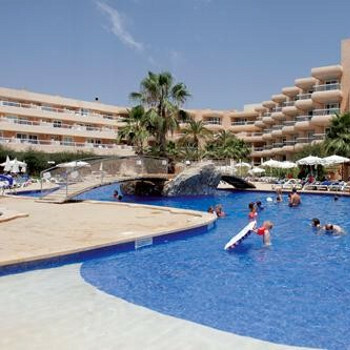 The Tropic Garden Hotel in Santa Eulalia, Ibiza, is a 4 star resort situated right on the seafront. With the Santa Eulalia beach just 800m away and all apartments offering a private balcony with pool, ocean or garden view, this would be a great choice for anybody looking for a relaxing holiday. The room (1345) was clean with plenty of storage space, bed was comfortable and the room had a good view across the pool area towards the sea. Good choice of food every day, all staff friendly and helpful. The coffee and cocktails needs to be improved as they are currently typical all inclusive and let down the hotel. Entertainment is aimed at children under 10, not adults, all the children seem to enjoy it. Hotel tip: Go for your evening meal after 8:00pm to miss some of the children if you are like us well over 50. The only issue I had with the room that was the tv should be in the main sleeping area for adults. Children sleep on the smaller beds and go to bed earlier and leave adults with no TV to watch to end the day.